The media is attacking First Lady Melania Trump for her White House Christmas decorations, comparing Mrs. Trump to an evil "ice queen" and criticizing her for wearing a coat while she helped decorate a tree. "The Obamas have set the bar high for holiday decorating; future First Families have big shoes to fill," wrote Harpers Bazaar. 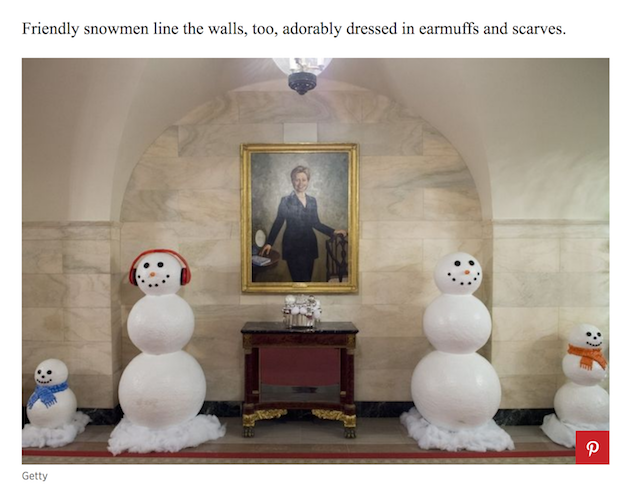 The fashion magazine was awestruck by "friendly snowmen" "adorably dressed in earmuffs and scarves," and said a foyer in the White House was "perfectly decorated." 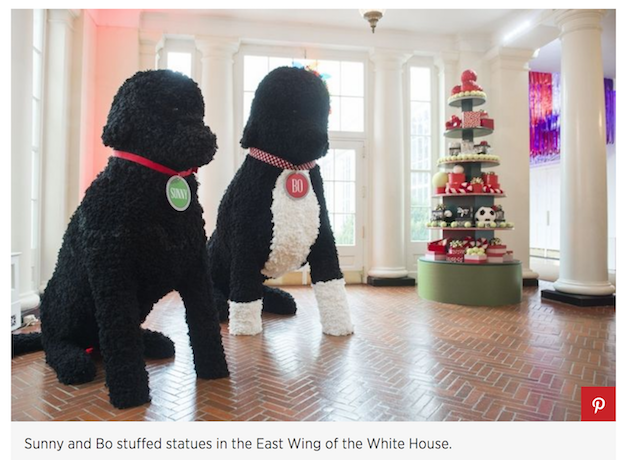 The magazine singled out "notable pieces of décor," such as the "super-sized stuffed toy replicas of the Obamas' dogs Sunny and Bo," which were especially terrifying given Sunny's penchant for mauling young girls and defecating in the White House. Harpers Bazaar had no such praise for the decorations this year. Instead, the magazine criticized Melania for wearing an off-the-shoulder coat while decorating a Christmas tree, and piled on a Twitter meme that compared the decorations in the East Colonnade to scenes in horror films. "Twitter really doesn't like the White House Christmas decorations," wrote Harpers Bazaar, adding, "It's been described as a ‘house of horrors.'" The hallway is lined with tall "glistening wintry branches," and leads to a Christmas tree that pays tribute to Gold Star families with star ornaments. Vogue also used the display as an opportunity to attack the Trump White House. 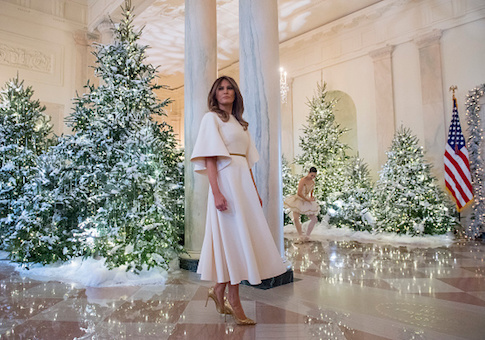 The fashion magazine criticized the decorations as being "very, very white," and evoking an "apocalyptic, barren landscape similar to what some of us imagine lies in America's future, or the calming white walls of a mental institution." Numerous mainstream media outlets wrote the same story. The New Yorker called Melania a "wicked queen," Elle UK said she decorated the White House "like a nightmare," while the Daily Beast headlined its story, "Step Inside Melania Trump’s Nightmare Before Christmas." This is not the first time the fashion world has attacked the first lady, herself a former super model who is fluent in five languages. Many criticized Melania for wearing stilettos in Washington, D.C., before heading to Houston to survey the damage from Hurricane Harvey. She changed into sneakers on Air Force One. Vanity Fair snubbed Melania from this year's best dressed list, but opted to include Barack Obama, who no longer is in office and often wears mom jeans. Vanity Fair praises Obama for that, too, featuring a slideshow tribute on its website, entitled, "President Obama: Forever in Dad Jeans." Not every news story used the Christmas decorations to take a political swipe. The Washington Post wrote a straightforward write-up of Melania's decoration choices, which were chosen under the theme "Time-Honored Traditions," a tribute to historical White House Christmas celebrations dating back to the John Adams administration. The decorations included an 18-by-6-foot Balsam fir "decorated with ornaments bearing the seals of every state and U.S. territory," a tree "dedicated to families that lost loved ones in the military," and a "350-pound gingerbread house in the State Dining Room offers a view of the White House from the South Lawn, with wreaths on every window and a U.S. flag flying from its sugary rooftop." The Post quoted Jennifer Pickens, an expert on White House East Wing traditions, who had high praise for Melania's décor. "Mrs. Trump's impeccable style is seen in the beautifully understated decorations and give a great nod to the First Families that came before them," Pickens said.